At least since 1937, two years before the out­break of Euro­pean hosti­lities, British intel­li­gence had looked into devel­oping alter­na­tive ways to de­stroy Ger­man facto­ries in the Ruhr Valley, Ger­many’s indus­trial heart­land. Late on this date in 1943 in Germany, a Brit­ish squad­ron of nine­teen modi­fied Avro Lan­caster bombers, each with a 9,250‑lb pay­load of one externally mounted, specially designed “bounc­ing bomb” (actually a revolving depth charge), flew toward three dams on the Moehne and Eder rivers in the Ruhr Valley. The spec­tac­u­lar feat of pre­ci­sion bombing, argu­ably the most auda­cious bombing raid of the Euro­pean war, breached two of the three tar­geted dams. The Moehne dam alone spilled around 330 mil­lion tons of water into the west­ern Ruhr region, devas­tating fac­tories, homes, mines, and farm­land for miles around. Some farm­land remained effec­tively un­us­able until the 1950s. The loss of the two dam power plants and the de­struc­tion of seven others inter­rupted hydro­electric power gene­ration for about two weeks. The greatest im­pact was felt, as intended, on the Ruhr’s muni­tions indus­try. Strangely, the RAF, which lost 8 Lan­casters and 53 crew members in the Chastise raid, did not return to bomb the dams as they underwent repairs. 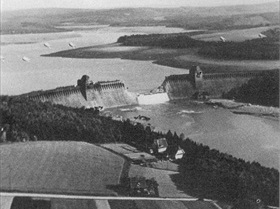 Left: The Moehne dam breached, photo­graphed by an RAF pilot on May 17, 1943, one day after RAF 617 Squad­ron had attacked the dam with their cylin­dri­cal bombs. Six bar­rage bal­loons can be seen above the dam. The two direct hits on the con­crete-and-steel gra­vity Moehne dam resulted in a breach around 250 ft wide and 292 ft deep. A tor­rent of water around 32‑1/2 ft high and traveling at around 15 mph swept through the valleys of the Moehne and Ruhr rivers in North Rhine-West­phalia, extending for around 50 miles from the source. 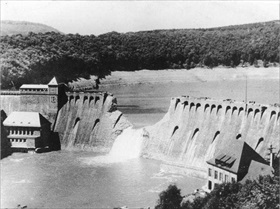 Right: The Eder dam, the largest in Europe, was also breached in two places. The wave from the breach was not strong enough to result in sig­nif­i­cant damage by the time it reached Kassel, the largest city in North­ern Hessen. The crest of a third dam, the Sorpe dam, had a por­tion been blown off but was other­wise un­scathed, pro­tected from the Lan­cas­ters by an in­creasingly dense fog that rolled in during the raid.